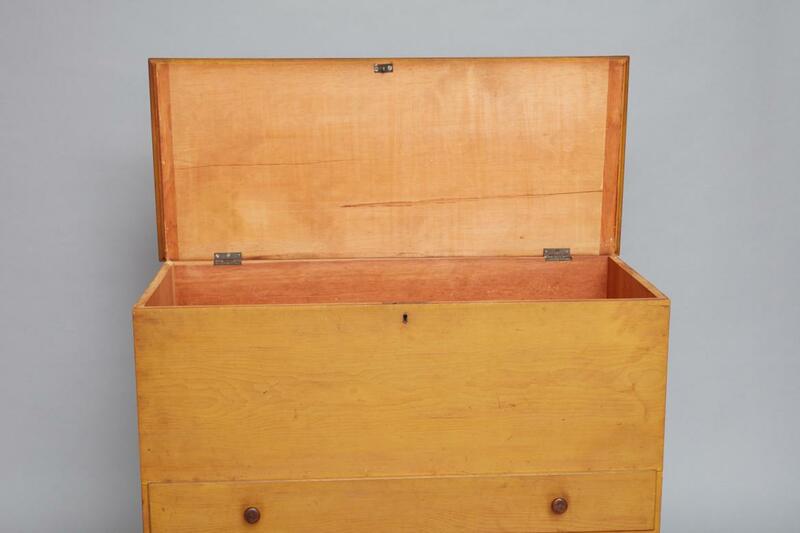 Pine, two-drawer blanket chest. Iron lock, brass escutcheon, maple knobs on the drawers, and basswood drawer bottoms. The lid has bread board ends which are probably glued to the lid board since it has two large splits emanating from the proper left bread board. Drawers lipped. The top drawer is 4 3/16" deep by 39 1/4" wide, and the bottom one is 9 1/4" deep by 39 1/4" wide. Lid hinged with two iron butts. Bright yellow wash applied to top, ends, and front exterior. Natural finish, spindle-turned knobs. Chests-with-drawers date back to 17th-century England. Craftsmen immigrating to the American colonies brought their joinery traditions with them, so chests-with-drawers could be found wherever English colonists, especially those from the western counties, settled and built furniture. American versions of the form have long been recognized in light of their English roots. Regional variants included "sunflower" chests from Wethersfield, Connecticut, "Hadley" chests from the Hadley-Northampton area of Massachusetts, and chests from the Guilford-Saybrook coast of Connecticut. Chests-with-drawers remained popular in rural America through the 19th century, when this chest was made in Mount Lebanon. 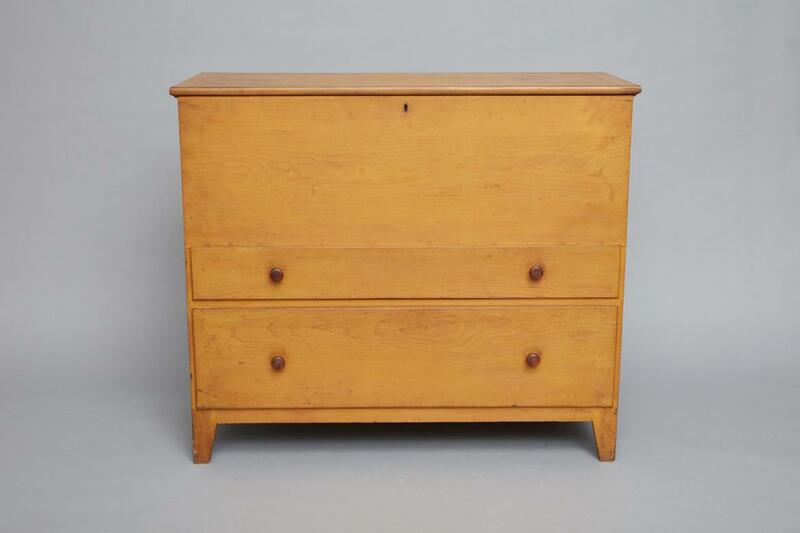 The Shaker chest-with-drawers should be viewed as another local expression of a traditional Anglo-American form. Shaker furniture was "local" not by geography but rather by style and decoration distinct from furniture made by non-Shakers. 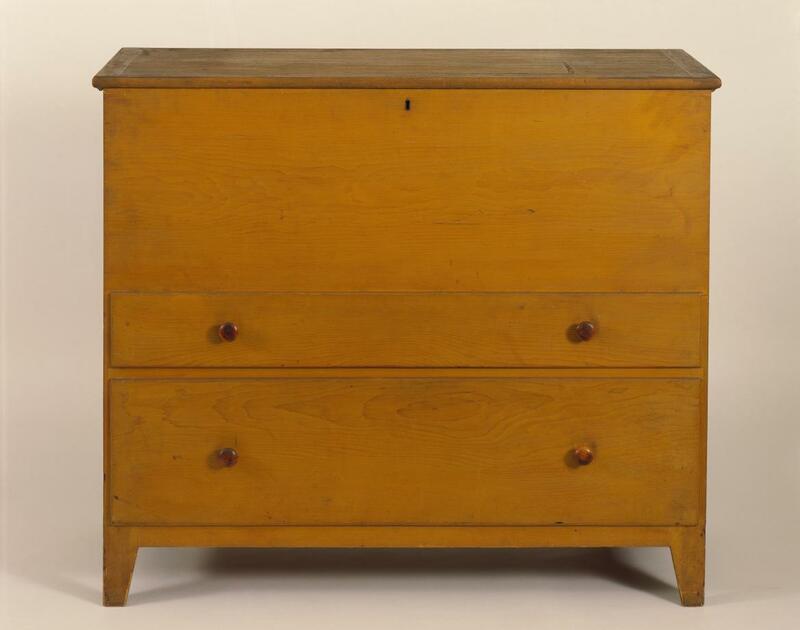 The lower drawer is nearly twice the height of the upper drawers, and the chest is covered with a bright yellow wash. Paints and washes were traditionally employed by non-Shaker craftsmen to conceal the pine or to imitate more expensive woods like maple, cherry, or walnut. 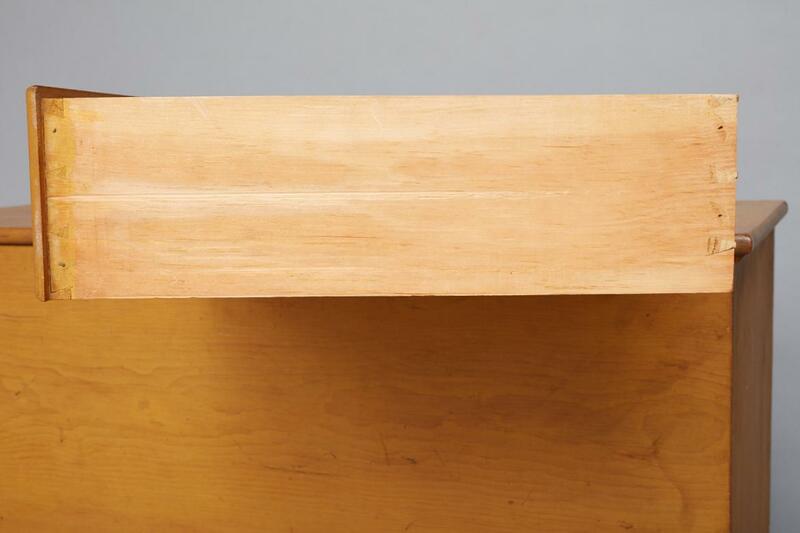 If the yellow wash of this chest is interpreted as concealing the pine and imitating maple or another wood, it seemingly contradicts the theme of honest-to-materials that permeates Shaker craftsmanship. However, the Shakers also remained traditional and conservative in their choice of furniture, clothing, and many other aspects of their lives. 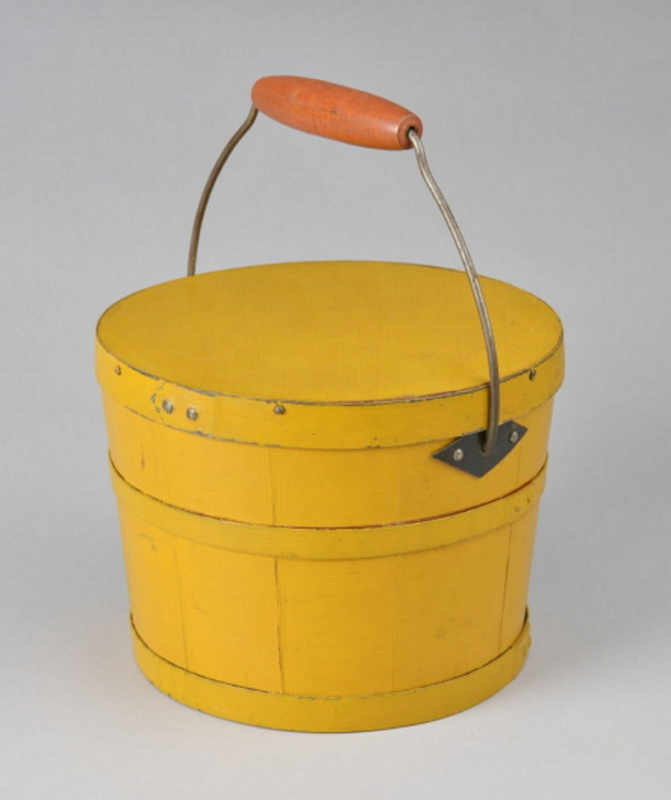 It should then come as no surprise that the Shakers, like traditional American craftsmen elsewhere, relied heavily on paints and washed to decorate their pine furniture. To leave it unpainted would have been unconventional, and therefore contrary to the Shakers conservative aesthetic taste. The sides of the case consist of single pieces of pine. 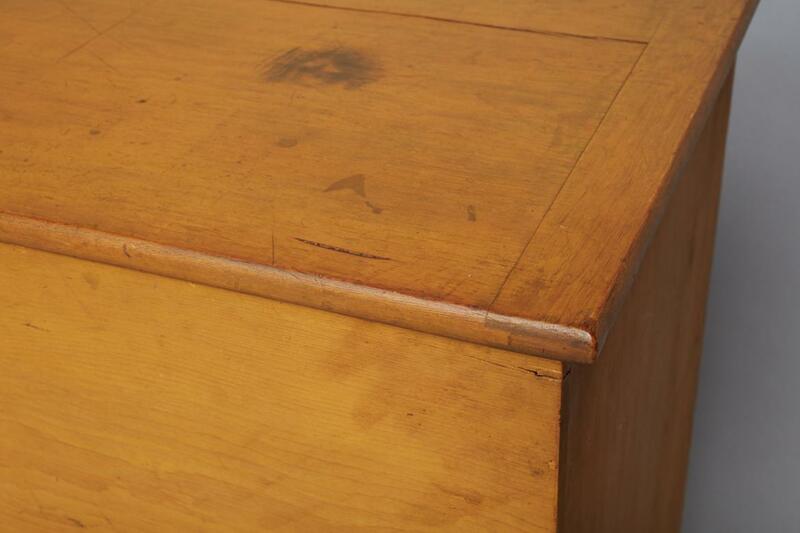 The top has end moldings which drop below the case, thereby acting as cleats and adding decoration. Rounded moldings overlapping the case can also be seen on the tops and sides of the drawers. 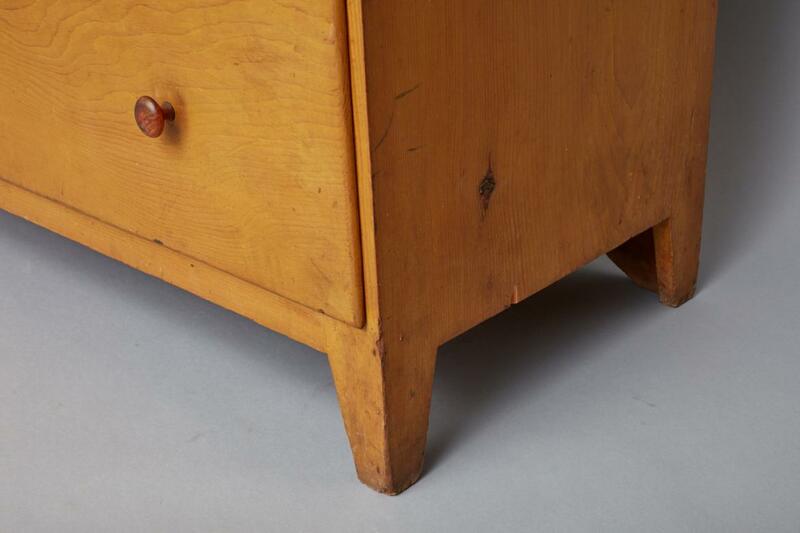 Large dovetail joints are visible between the drawers holding the dust board. The sides of the case and the drawers are nailed together. References: Kassay, John. The Book of Shaker Furniture. Amherst, MA: University of Massachusetts Press, 1980. p. 114. Rieman, Timothy D. and Jean M. Burks. The Complete Book of Shaker Furniture. New York: Harry N. Abrams, Inc., 1993. p. 140. Kirk, John and Jerry V. Grant. "Forty Untouched Masterpieces of Shaker Design." Antiques 135 (May 1989): 1226-1237. plate VII. Kirk, John. "An Awareness of Perfection." Design Quarterly No. 154 (Winter 1992): 14-19. p. 18.